When the GuideGrooves are in place on the SupportStrings, you can glide the EBow to and from the pickup along the strings. This controls dynamics (volume) and creates dramatic tonal changes. Only your bass pickup should be on. As you glide the EBow toward the pickup, the volume increases and the tone brightens. For mellow sustain, back away from the pickup. For violin-like bowing strokes, glide the EBow toward the pickup with each note you play. In the harmonic mode, this technique creates a wah effect. Position the EBow at least 2 inches away from the bass pickup and slowly glide toward it. Notice where the sound begins to get louder and brighter. This is the beginning of the basic playing area. Now, glide the EBow over the pickup until you find the loudest spot. This is the HotSpot. Lower your volume if this becomes too loud. A humbucker (double coil) pickup has two HotSpots with a dead spot in the middle. 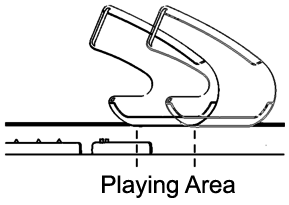 From where the volume starts to increase, up to the HotSpot, is the basic playing area (about 1 inch). It is important to become familiar with your pickup's playing area for overall dynamic control. Gliding the EBow near the pickup when not playing can create unwanted noise. To avoid this, lift the EBow from the strings.